The program, called Chiptopia, is designed to appeal to the chain’s most frequent guests. Chiptopia’s rewards trump those offered by most other leading loyalty programs, such as Starbucks’ and Dunkin’ Doughnuts’ programs, according to Saleh. For example, it offers about three times the payback per dollars spent than Starbucks’ loyalty program. But there’s a catch: the program is only temporary, lasting just three months. “The program’s end in September could alienate some customers just as they are getting accustomed to the rewards,” Saleh writes. “Given the generous nature of Chiptopia, we would be very surprised if the program is continued after September, but believe the company could continue a loyalty program in some form if the results are encouraging,” Saleh writes. 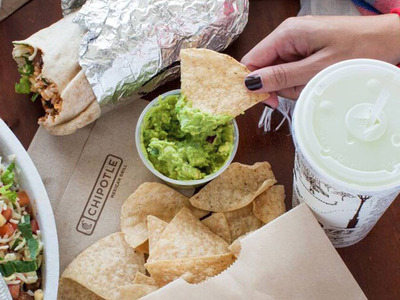 Chipotle has been spending millions of dollars since February on free-food offers, including direct-mail coupons and mobile offers, to encourage customers to return to its restaurants in the wake of an E. coli outbreak that sent the chain’s sales plunging. The outbreak, which sickened more than 50 people in 14 states, was declared over in February. But Chipotle’s sales have yet to bounce back. The chain’s same-store sales dropped 30% in the first quarter of the year.